First of all, a clarification: when right-wingers talk about “closing the borders,” this isn’t what they mean. 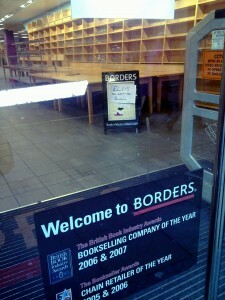 The big news over the past week is that Borders Books is officially going out of business. But Barnes & Noble continues to succeed, because there’s a difference between Borders and Barnes & Noble, a difference in how the two companies approached the book industry. Barnes & Noble has embraced the ebook—a little later than Amazon, but at least they did. Barnes & Noble has embraced online ordering. You can even special-order copies of my books at Barnes & Noble stores. And Barnes & Noble got the Starbucks deal, too. Barnes & Noble probably sells more coffee than books. A friend recently asked me whether books would completely disappear. I had to correct her: ebooks are books, too. Now, I don’t think paper books will ever completely disappear. (That’s a different post.) However, ebooks present a number of advantages to authors, not only in what ebooks do for authors, but also in the market changes they portend. Everyone keeps talking about the demise of the book industry, because people no longer buy books at bookstores. But if you include ebooks and online sales, the book industry is most certainly not dying. And if you include all reading of all online content, the writing industry is more active than ever. And the book industry is changing in ways that portend more and more good things for authors. It used to be that if you wanted to build a fan-base and share what you’ve written with the world, you would find a publisher. If your writing showed promise, the publisher would help you whip it into shape. And as you wrote more books, your new fans would go back and buy books from your growing backlist. Your publisher would make money by helping you further your writing career. Then there was the Thor Power Tool court case against the IRS. And it was no longer cost-effective to keep inventories of non-selling items (such as an author’s backlist), against the hope that some of them would indeed sell. And so publishers stopped stocking mid-list authors’ backlists. Only backlists of famous authors continue to remain available for purchase. And then big-box book stores, like Borders and Barnes & Noble, started ordering to the net. And that gave you exactly one chance to become a best-seller, because only best-sellers got reordered. And that killed the career of the mid-list writer… at least of the traditional mid-list writer. And then print-on-demand made it possible to “stock” titles without actually keeping a physical inventory. Indie publishers and indie authors flocked to this technology, and even some larger publishers started making some authors’ backlists available via print-on-demand. But not enough to save the career of the mid-list writer. Most publishers resisted change, because they were wed to the big-box mass-market model. They couldn’t see any value in the long tail, in serving the mid-list author with a large backlist. And now with the rise of ebooks, the transformation has completed. Big publishers still resist it, because they resist change, and so they’re terrified of ebooks. But they do so to their own demise. In this new market, ebooks represent cheap, low-risk, impulse purchases. And they sell. Now, any author can publish her growing backlist on the Kindle and on Smashwords, with almost no publishing investment. And she can build her fan-base, risk-free. And she can make a larger royalty doing that than she ever had before with a traditional publisher. And the career of the mid-list author has begun to rise from the ashes. An extended family member asked me a year or two ago about getting published. I explained that I ran my own publishing company, but that wasn’t for everybody. And I really didn’t have any good advice for her, any strategy that I felt I could recommend without possibly leading her astray. I couldn’t in good conscience tell her to publish her manuscript on the Internet, because if it didn’t work out, I couldn’t tell her it would still have been the right thing to have done. But should she try to get a publisher? Getting published is still a dream, alive and well, with many aspiring authors. But the traditionally published route is hard and painful and isn’t really a good way for most people to build a writing career. Getting published is more like being the rube of honor in a reality TV show. (But that’s a different post.) I wouldn’t wish that on anyone, most of all a family member. So I had nothing to tell her. But since then, epiphany struck. I learned that some mid-list authors make less money off their books than even I do, because they sold their souls to their publishers, who are keeping their backlists off the market (out of print and unavailable as ebooks). And now I do have something to tell my family member. There’s only one real reason to “get published.” — Correction: there are several emotional reasons why someone might want to get published, such as a desire for status, the feeling of being an insider, social recognition. But there’s only one business reason to get published—and if you’re talking about building a writing career, this is all that counts. The only business reason why you’d want to get published is if you’re going after the mass market. And by “mass market,” forget Barnes & Noble. I’m talking Walmart. If you have a plan to see your book on grocery store shelves, and you honestly feel you can pull it off, then pursue traditional publishing, because that’s the only chance you have to realize that dream. You want to sell a gazillion copies. You want everyone to read your book, and you’re willing to write down to the lowest common denominator in order to see that happen. If true, as science-fiction author Theodore Sturgeon wrote, that 90% of everything is crap, then you dream to be counted amongst that 90%. For most of us, that’s not what we want. As for myself, I’d be embarrassed to see one of my books ranked among the tripe I see stocked at the local drugstore. Because I have so little respect for that market. Most of us, we have a passion for what we write, and this passion sustains us in our writing. We don’t just write to the lowest common denominator. We write to specific readers. We write for those who will share our passions with us. We write to make a difference. We are mid-list authors, but only if we keep writing and keep sharing what we write. It used to be that the only way to share was to find a publisher who would support your career. But that’s no longer true. Borders tried to hold on to a bygone era, and that’s why they failed. They didn’t embrace ebooks, and they didn’t even embrace print-on-demand. (You couldn’t even special-order a copy of one of my books through Borders; call me vindictive, but I’m not all that unhappy to see them go.) I don’t think they were trying to snub ebooks, but they overlooked the future in the changing book market. Most aspiring authors will do just as Borders has done. They’ll continue to seek publication through a “respectable” publishing house, not realizing that this route—if they’re lucky—will mean the rapid demise of their writing careers. Because whether you get published or self-publish, you—and you alone—are responsible for your own success. No “respectable” publisher will look out for your writing career, not anymore. There are indie publishers who may help you with your career. Niche publishers. Boutique publishers. They don’t get into Barnes & Noble, either. (Nor into Walmart.) You might find one who has developed a business model and market that works well with what you want to write and who you want to write it to. In terms of “getting published,” they are part of the future. The other part is the indie author. Not the self-published author, who’s only publishing her own stuff so that she can see it in print, or so that she can give copies to friends and family, or as an experiment or stop-gap measure until she can find a “real” publisher. But the indie author, who pursues self-publishing as part of her business model, who runs her own publishing company, and who thereby manages her career for her own ultimate success. The end of Borders doesn’t portend the end of the book industry. It announces the arrival of the new book industry. Be proud to be part of it! My question is how does one start/run her own publishing company? Any information or resources you could point me to would be greatly appreciated? What the end of Borders and the end of the traditional publishing industry means is the rise of total crap. You mentioned blogging as a new evolution in the “writing industry.” Last I checked there was no such thing. An “industry” by nature needs profit to survive. Most blogs are not profitable, even if they use ad banners, and most readers use ad blockers and filtering software that blocks the banners anyway. Nobody likes to be reading an article and then have a big ad for blue pills or fake handbags pop out of nowhere. Plus, most bloggers are not good writers. They’re readable (well, some are anyway, the Twits on micro-blogs notwithstanding), but readability does not necessarily equate to storytelling ability. Granted, not everyone who writes a book will go for a fiction path. But for those who do, they are forced to dumb their talent down for the interest of “analytics” and “optimization”; a few choice blogs may end up in the top tier, but that says nothing for what happens to the short story or novel. Somehow I fear that it will go the way of the eight-track and the campfire circle as mere memories of communication past. The rise of ebooks has indeed killed the “traditional midlist author” and brought a new “midlist” that is close to impossible to break out of, simply because there are more people getting involved than ever before. There’s no quality control with the end of traditional publishing, and there are too many heads in the group from which to distinguish oneself. Plus, no longer does a “bestseller” incorporate writing ability as the primary reason it becomes one — promotional ability, this thing called “platform,” or “presence,” or “networking,” which is really equal part sugarcoating to make nice and bull$*** to make headway. Just look at the “democratic” model of Harper Collins’ Authonomy, a nice idea on paper but a failure in practice. All too often the “up votes” went to people who’d been generous in giving others kudos and gold stars and reciprocating in return; it did nothing to offer valid critique or editing, because that would bruise the writer/user’s ego too much and wind up with down-votes turned to playground anarchy. The “democratic” publishing model is really the diplomatic equivalent of Jersey Shore. But it’s also about advertising, just like how baseball is no longer America’s pastime but “passive income” for the stadiums that re-christen ballparks with their company brand. The next thing for publishing, if it hasn’t come to this point already, will be advertisements inserted within the Kindle “book” itself (sorry, but ebooks are not books, at least not to me), and someday even the content diluted with pointless SEO keywords and “trending topics” — the Google-ization of literature is what it will be. You’ll have marketing “gurus” commissioning aspiring authors to write “novels” with thinly disguised versions of the CEOs themselves as the “heroes” and their rivals as the bad guys. Captain Coke vs. the Mad Dr. Pepper. Electronic publishing is maybe the best thing that could happen for the BUSINESS of the Internet, but the worst that could happen for writers (who are too prolific and intelligent to call themselves “bloggers”), for publishing industry employees, such as agents and editors, who will maybe have an edge in re-branding themselves as “coaches” or “marketing experts” or some such puffed-up title, and yes, in the end, for the readers, whose chance to experience the next War & Peace will be diluted yet again, thwarted by the One Percent Powers That Be who’ve managed to make something corporate and soulless out of the one thing sacred to our very human existence: the creative spark that ignites a powerful human narrative. Mechanized, monetized, and in the end, pulverized.